Rantalomalle tai rentoutua upea allas cocktailin. Kaikki 24 tunnin vartiointi vain 1. 5 tuntia Bangkok (BKK) lentokentältä. Huomaa, että tämä on 50m2 huoneisto, useimmat halvemmista paikoista täällä ovat noin 20-30m2 ja erittäin ahdas. Wifi internet, 42 "HD Sony Bravia TV, DVD, liesi, jääkaappi, mikroaaltouuni, kaikki astiat mukana, pyyhkeet kylpyhuone ja ranta, lepotuoleja parveke. Tarkista sisään 14 jälkeen ja tarkista klo 10 mennessä. Sinä kerää avain 24 tunnin turvallisuus aulassa. View Talay monimutkainen aulassa sisältää kaikki mukavuudet mitä tarvitset, jotta lomastasi täydellinen, mukaan lukien pesula, mini-market, nettikahvilassa, matkatoimisto, auton ja moottoripyörän vuokraus, ja ravintoloita. Se sisältää myös 24 tunnin vartiointi pysäköinti. View Talay 5C sijaitsee aivan oven Jomtien monimutkaisia ​​(5 minuutin kävelymatka), joka tarjoaa erilaisia ​​viihde vaihtelevat fine dining, pub ja kabaree tyyliin baareja, kuntosali, internet kahvila, kylpylä ja thai-hierontaa ja monet muut viihde ja palvelun ominaisuuksia . On myös monia muita paikkoja alueella kävelyetäisyydellä tarjoaa kaikenlaista viihdettä ja palveluja. Sähkö, vesi EI sisälly vuokraan. Talletus otetaan BAHT500 / week tai vastaava edessä käteisellä johtajalle ja vesi ja sähkö minun kustannuksella vähennetään lähtöselvityksessä ja tasapaino palautetaan. Super, kann man nur weiterempfehlen. Es ist eine schöne und funktionale Wohnung. Alles vorhanden was man benötigt. Direkte Strandnähe, zentrale aber trotzdem ruhige Lage. Auch das Ein - und Auschecken ging problemlos vonstatten. Würde diese Wohnung jederzeit wieder buchen. Möchte mich für den schönen Aufenthalt auf diesem Wege bedanken. I was extremely happy with my stay at the condo. 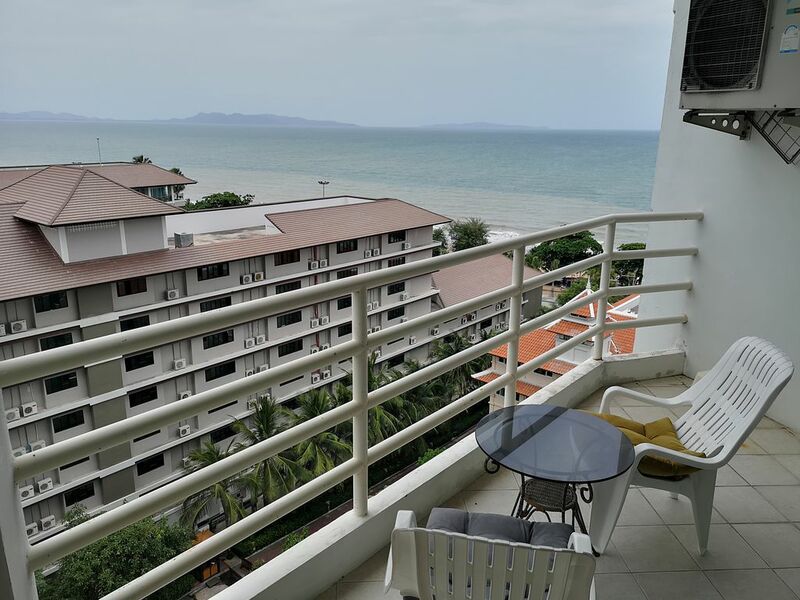 The condo offered everything a single person or couple would need so as to enjoy their stay in Jomtien Beach. The condo was comfortable and offered a wonderful view from the 11th floor. The condo's location was also perfect. It was approximately two blocks from the bus station for those taking the bus from the airport. It also had a good grocery store nearby and was very close to the beach and restaurants. I would definitely stay in this condo again when visiting the Pattaya area. Great location and great studio apartment. The price was a very good value for Pattaya. The swimming pool was very large and very clean. I liked that there were stores on the first level to buy groceries and book taxis etc. All in all, a nice place to visit and relax. Highly recommend this place to all! We had a lovely stay at the Jomtien apartment rented through Hamish the owner. Our room was very spacious and clean with Thai charm! It was great value too, the location beside the beach is away from the party area so you can sleep at night in peace and quiet, but you can walk there in minutes. We used the pool at the apartment a couple of times for an early evening swim then eat at the poolside restaurant. Linda helped us rent motorbikes and local sims for our cell phones for our stay. We loved having the convenience store and laundry on the first floor as you walked in. I would definitely come back and stay here again. Check in/out fuss free even though we arrived really early in the morning. Recommended for value travelers. My vacation was ruined after renting here!! Run away from this listing folks! I cannot express more strongly how horrible my experience was in this apartment! During my stay, both the power and water were shut off, making the place uninhabitable. The apartment owner flagrantly ignored paying his utility bills for months, and his manager was nonexistent. I was forced to rent another place. My vacation was turned nightmarish because of this listing's owner. Don’t let this happen to YOU! If you think there is something strange about this review from "Adryan"....then you would be right...! The problem all along here was the guest trying to get out of the rental Agreement because he had ultimately booked not one but 3 apartments (incl mine) in total. Unfortunately the VRBO/Homeaway system does not stop guest reviews like this being posted. There is nothing more to add really except my other great reviews from fantastic guests speak loudest. the apartment is nice and the outlook great. I can my friends Recommend further.we say thank you will come again. Hans and his wife were model guests. Initially we had a few language problems over the wif (I don't speak German) but it all got sorted out in the end. They are most welcome again as guests. Condo sijaitsee hyvin tunnettu View Talay 5C monimutkainen aivan suosittu (Dongtan) ranta 50m kävellä tai voit laiskotella altaalla koko päivän. Fabulous ostoksia lähellä, hyviä ravintoloita muutaman sadan metrin kävelymatka ja aina niin suosittu yöelämä. Electricity, water is NOT included in the rental price. A deposit will be taken of BAHT500/week or equivalent up front in cash to manager. Water and electric at my cost will be deducted at check out and balance refunded. For all stays there is a cleaning fee charged on departure. This is included in your quote. A refundable Security Deposit (excluding electric & water deposit) is included in your quote. This Security Deposit shall be refunded on departure after keys are returned less any adjustments for expenses necessarily incurred by the Homeowner in remediation of any damage or loss to the property by the Guest. Refer to the Check in Procedure and Rental Agreement.